This week was Remembrance Sunday in the UK, when we remember all those who have fought and died for their country in war. At St John’s it’s always a big service. We have lots of extra people in the congregation, and all our young people’s uniformed groups – scouts, guides and so on – are on parade.We have the Service of Remembrance culminating in the two minute silence at 11am. Here’s what I said. This year saw an important seventieth anniversary to celebrate for many. Yes, 1945 was a good year for rock and pop music. It’s the year Rod Stewart – who sang at the Festival of Remembrance last night – was born, along with Eric Clapton and Pete Townshend, Rita Coolidge and Carly Simon, Bette Midler and Don McLean, Bryan Ferry and Van Morrison – and even Bjorn Ulvaeus of ABBA fame… what a list! Familiar names to anyone of my age who started listening to music in the late sixties and the seventies. But 1945 is also, of course, a somewhat more significant seventieth anniversary, as I’m sure you all know. Some of you here will remember the end of the Second World War. Most of us here don’t. Go back one hundred years and we are in the middle of the Great War. Only a few who were small children then can remember the events of the First World War. And yet although we can’t remember the actual events because we weren’t there, yet we still come together to remember. This year, we remember, among so much else from that conflict, the death of the nurse Edith Cavell. Today I want to take you back two hundred years, to another war that until the First World War was known in this country as the Great War – the war against Napoleon that culminated in the Battle of Waterloo, in what is now Belgium. This year saw the two hundredth anniversary of the Battle of Waterloo – the great battle at which the French Army of Napoleon was finally defeated by the Allied Army under the Duke of Wellington and the Prussian Army of Field Marshal Blucher. It’s one of the most important battles of British history – ending as it did 800 years of conflict between France and Britain, and heralding 99 years of peace in Europe. And I want to tell you the story of three soldiers from Waterloo – because they show us how, long ago as it was, people still want to remember. I was able to stand on the field of the battle of Waterloo on the 18th June this year – two hundred years to the day when the opposing forces met to decide the fate of Europe. And the three soldiers that I want to tell you about today were there. One fought for the French, the other two for the British. Two of them survived. The other died. And the reason why they are important is because as I stood there on the field of the battle, two people there in the tour group I was one had come specifically to remember two of them. And the third is still remembered for a very special reason here in Caterham. Of those two people on my tour one had come from Australia. He had come to see where his ancestor had fought and died. His ancestor was numbered among the 22,000 who were killed or wounded on the Allied side. He had come to remember. The other had come all the way from the United States. Her ancestor was French. He had fought and survived as a member of Napoleon’s Old Guard, and like many of the surviving French soldiers subsequently emigrated to the United States to find a new home in the republic of the USA and to escape the re-established French monarchy. She had come to remember and to see where her ancestor fought and where his life changed. It was intensely moving to stand as a group, right in the centre of the British line of battle, at 1.30pm two hundred years to the day when the battle was at its height, and to raise a toast to all those who fought and died on that day. And to be able to do so with two people who had very personal reasons for remembering. Thousands of those who died were simply buried where they fell. I’ll come to the third soldier in a moment, while I tell you about another act of remembrance of that great battle that happened while we were there. On the 17th June this year a new memorial was unveiled by Prince Charles, along with three descendants of the three generals – the 9th Duke of Wellington, Prince Nikolai von Blucher of Prussia, and Prince Charles Bonaparte, at the chateau farm of Hougoumont on the field of Waterloo. The fighting at the chateau, where British guards defended the right of the British line throughout the day, was key to Wellington’s success. And the memorial that Prince Charles unveiled – a stunning representation of two Coldstream guards closing the gates to prevent the French entering and capturing the chateau – is amazingly the first memorial at Waterloo to the British Army, and the rank and file, as a whole. We were able to visit the memorial following day on the anniversary of the battle. But back to the third soldier, the one I said was remembered here in Caterham. His name was Samuel Gibson. Having joined the 27th Foot as a boy of 13 in 1803 he found himself in time at Waterloo. Discharged from the army the same year on a pension of 1 shilling a day, he died at the Metropolitan District Asylum in Caterham at the age of 101. He was the last known Waterloo veteran of the rank and file to die. He was given the honour of a military funeral and is buried in St Mary’s churchyard. Gibson Way, recently built as part of a new development, was named after him. Two hundred years on people still remember, even though none of us were there. Much about the Second World War is the same. Most of us weren’t there, but we still remember. For some of you there’s no need to remind you of the news headlines of 1945 – you remember them, all too well. Events 70 years in the past that may seem all too clear still today. Others of us had our childhood years in the fifties and sixties, and our parents still talked about the war. For some of us, these are events 70 years in the past that are things we learn about in history at school. Some of us today remember all too well, others of us need to be told of those memories. And yet, whether we were there or not we gather together today to remember. 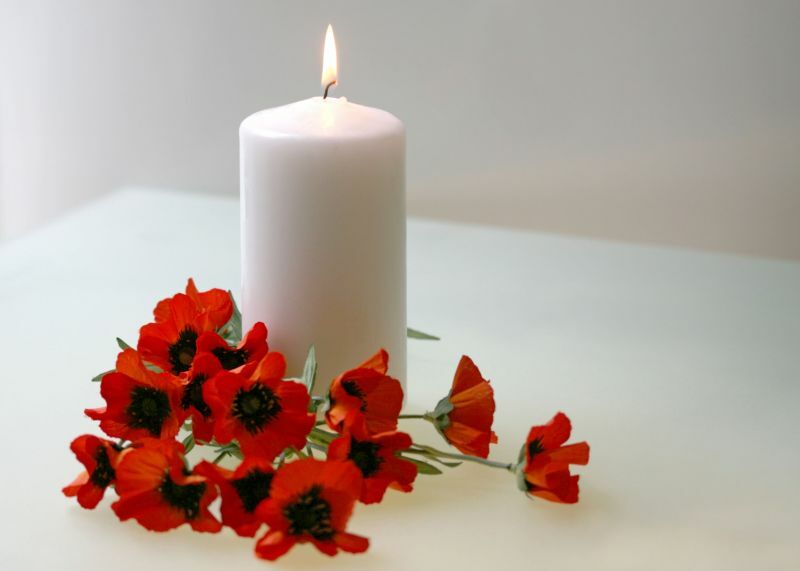 To remember those from our family, or our friends, whose lives were changed or ended by war. To remember years of war and strife that we were involved in, or that our parents, our grandparents were involved in. Wars near and far – just across the channel or around the other side of the world. And as if we needed reminding of the awfulness of war we are still faced with headlines today from around the world, and we still see our forces coming face to face with death every day. We come together to remember. And the importance of remembering is just as strong, and just as necessary, as it always has been. Because even today people still feel a connection with those who have fought and died in wars and conflicts reaching back hundreds of years. And people will go on remembering and wanting to remember into the future, even though the events of today and the events of yesterday will recede further into the past. And remembering is also about looking forward too. It’s about using our experience of the past, our memories of the pain and the hurt we ourselves may have experienced, our sense of loss because friends and relatives never came home, to spur us on to create a better world – a world where people can live at peace with one another, a world where people can live in freedom – freedom not just from war, but from hunger, from disease, from oppression, from poverty – freedom to be the people God created them to be. So many have fought and so many have died to help create the relative peace and freedom we enjoy today. That is why a part of our remembrance service each year, as we honour their memory, is about pledging ourselves to work together for a world that we all want to live in – a world where everyone can live in peace, knowing justice, and freed from suffering. The Christian message is that God sent his son Jesus, the Prince of Peace, to bring the good news of salvation to a world that is in so much need. We all still need to hear that message, to know the love and peace that only Jesus can give in our own lives, and to share that love and peace will all around us. And so we come together to remember. And as we offer prayers and thanksgivings for all those – combatants and civilians – who have given their lives in war, as we pray for those who mourn them, as we ask God to be with those who serve today, we commit ourselves anew to the service of God and humanity. And we pray that God will use us to bring the peace and justice to our world for which so many in all kinds of ways have striven and for which so many have sacrificed their lives. Bible Sunday – and when did you last read your Bible? Christ the King – Where is our true home?